In 406 BC Agamemnon is planning to set sail for Troy to redeem the bride of his brother Menelaus, from the arms of Paris, prince of Troy. He is stalled at the beach, his men are itchy with blood lust, and he is forced to make a decision about sacrificing his family for the glory of Greece. Two days ago, Antonis Samaras – the current ruler of Greece – was forced to step in when relations between his finance minister and his creditors, itchy with blood-lust, took a dramatic turn for the worse. It seems not much has changed in Greece in the last couple of thousand years. It is still a country cloaked in a drama that is lined with irony. To spend an evening with a play written when Greece was at the height of her power was definitely ironic given the state of affairs there now. Aristotle would be teaching Alexander the Great just one hundred years after Euripedes wrote Iphigenia in Aulis. Soon the Greeks would go on to found the disciplines of science, politics, morality and metaphysics. And just like any of the great Greek tragedies, they find themselves today squabbling with creditors, just two years out from certain bankruptcy. All this added a dimension to the wonderful play Trapped in Mykonos that has already taken up many dimensions of irony Euripedes didn’t intend when he wrote the play originally. With a fascinating adaptation by Nicole Colantoni that transports the play in to current times, Director Antoinette Barbouttis has chosen to set the play in a bar in Mykonos, substituting ancient Greece for a more familiar and contemporary Greek face. Trapped in Mykonos gives us the Greece we know today. 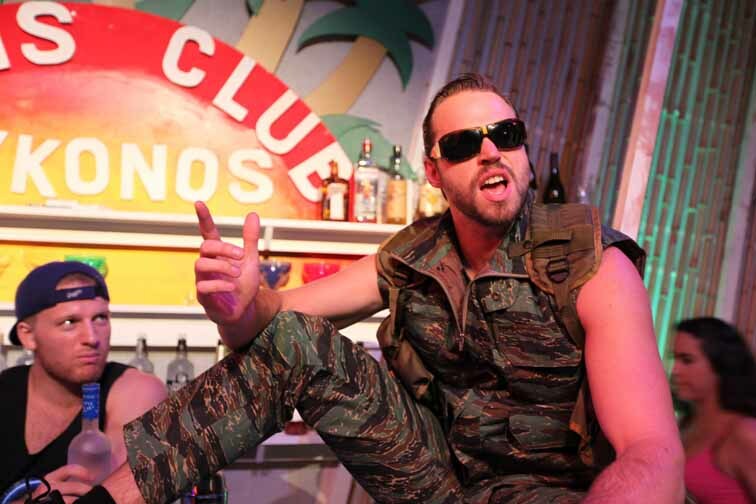 Agamemnon is a large man who gets around on a golf cart, comfortable in his shorts and cruise shirts. Clytemnestra is dolled up the nine’s in her Gucci sunnies, dripping with the gold one would expect from a the wife of a Greek King, and Achilles is dressed in – of course – army fatigues. It’s a nice touch, bringing the whole thing into the present day, and given the significance of this time of history for Greece, the timing for the new production seemed perfect. Gravas Productions have just hit the scene, starting a theatre company dedicated to displaying young up and coming talents. Euripides is a great place to start if you want to get your feet wet in theatre, and is also a sign that the company means business. The play might be light, dancing in the bars of the Greek isles, but the dialogue and complexity is very AD Greek tragedy. The staging and sets are all strong, adding to the cultural and contemporary aesthetics of the production. Anthony Hunt carries the show on his shopping cart wheels as the desperate Agamemnon. He plays a king moving constantly in circles, difficult to pin down to a moment or a decision. The complicated idea of his moving in a small cart gives the impression of a man who can travel long distances and yet is woefully trapped – the classic dilemma of Agamemnon. He is evasive rather than decisive, and looks far more like one of the troupe headed off to convince the creditors Greece will be fine, than a king about to draw sword for an honor he isn’t convinced matters. 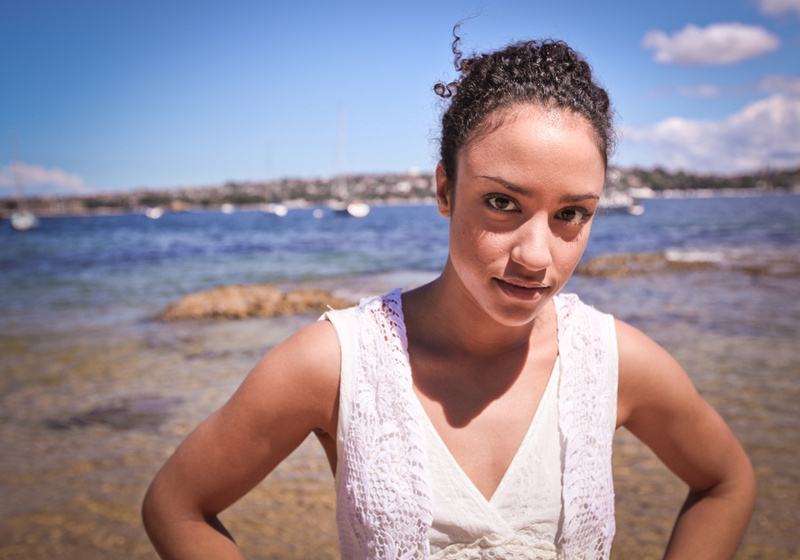 Dimity Raftos is great as his wife, appropriately fussing over her daughters forthcoming marriage to a great warrior, flirtatious and then the ferocious mother when the truth of her husband’s betrayal reaches her ears. She doesn’t pretend to love her husband, but she does appeal to him over her sense of loyalty – a display that strikes at the heart of many modern marriages. The dynamic between Andrew Steel and the very beautiful Isaro Kayitesi as Achilles and Iphigenia is striking and adds a lot of spicy tension to the narrative. Steel was a standout, bringing a lot of comedy to his role when performed in a contemporary setting. Kayitesi does a good job with a challenging role. She’s a laid back Iphigenia, falling at her fathers feet to beg when she wants to be saved, and appropriately standing tall when she decides to accept her fate. The strength flowing between her and Steel made me wonder at one stage if Achilles was going to run off with Iphigenia in this version. But that is the strength of holding the production in a contemporary setting – the feel that it all might take a different turn this time around is very hard to shake. Pasting everything together is the Greek chorus, humorously played in this version by Elly Clapin and Sasha Hoffmann who are often hilarious as they rattle off their translated ancient Greek with bogan accents. They book end Jeremy Burtenshaw’s dramatic additions, enthusiastically pronounced while wearing boardies and a tank top. 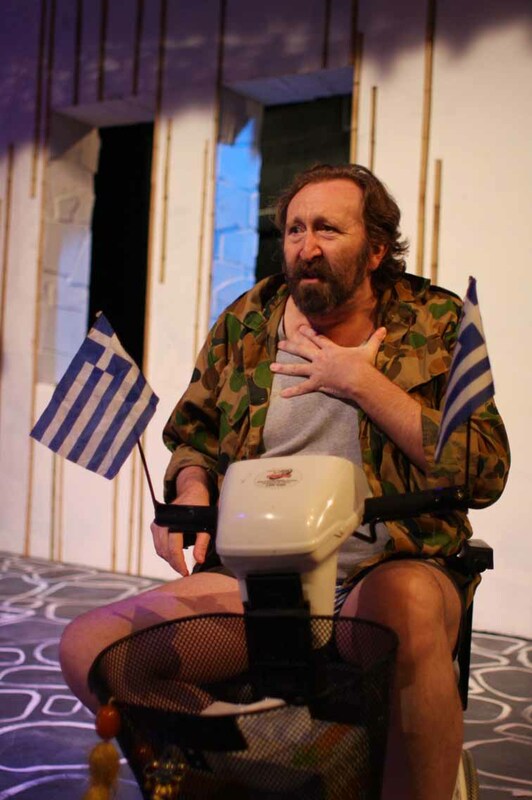 Finally Paul Armstrong brings it all together as a wonderful Menelaus – another older Greek gentleman getting about in his beach gear. This little piece of theatre is great fun, energetic visually stylish (the sets are great) and a wonderful debut for a company that has set the standard for itself very high. Trapped in Mykonos is playing April 4 through to 13 and you can grab your tickets here.